Oral hygiene is extremely important for numerous reasons. First of all, the better your oral hygiene is, the less likely you’ll need to pay for costly dental procedures in the future to fix damaged teeth or diseased gums. This makes our oral hygiene tips incredibly important for the health of your mouth. 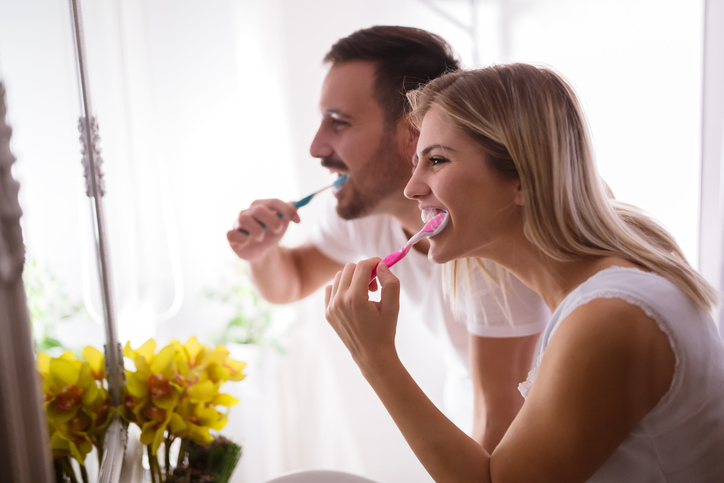 Brush your teeth regularly – Brushing your teeth will help to remove food debris and prevent plaque and bacteria from building up on your teeth and between your gums. Brush twice a day for at least two minutes at a time. Use the right toothbrush – Use a small or medium-sized toothbrush that has a smaller head and smaller bristles. Bigger toothbrushes have a tougher time reaching the crevices of your molars, which is where food debris often hide. Use the right toothpaste – There are a lot of different types of toothpaste to choose from. Make sure you use a brand that has the ADA (American Dental Association) seal of acceptance on it. Consider toothpaste that contains fluoride—fluoride helps to strengthen your enamel, which will make your teeth less likely to decay. Get a new toothbrush every few months – The bristles on your toothbrush will deteriorate over time, so make sure to replace the one you’re using every three to four months. Consider getting an electric toothbrush – An electric toothbrush can help to remove bacteria and food debris from your teeth more effectively than a regular toothbrush, especially if you have arthritis and have difficulties holding a regular toothbrush. Floss regularly – In addition to flossing at least once a day, make sure you’re flossing properly. Use at least 18 inches of floss so that you’re not reinserting food debris and bacteria that you just flossed out. Floss by wrapping it around your tooth in a C-shape for the most effective results. Use a tongue scraper – A lot of bacteria gets onto the tongue. While you can brush your tongue with your toothbrush, you’ll have an easier time removing bacteria by using a tongue scraper. Not only does a tongue scraper help get rid of bacteria, it will help make your breath smell better. Use mouthwash – Use mouthwash after you’ve brushed and flossed. Doing so can help to kill any leftover bad bacteria that you missed and can help prevent gingivitis. As an added benefit, the use of mouthwash can help prevent bad breath. Rinse after meals – Brushing after every time you eat is a little unrealistic, especially if you have a lot of snacks throughout the day. At the very least, you should rinse your mouth with water after you eat to get rid of all of the food debris left in your mouth. Don’t smoke – If you smoke or chew tobacco, quitting will improve your oral hygiene. Tobacco will stain your teeth and will increase the risk of gum disease and oral cancer. Improve your diet – Improve your diet by cutting out sugary foods, which can cause tooth enamel to erode. Make sure you’re getting a source of omega-3 fats as they can reduce inflammation and lower the risk of gum disease. Your oral health will be a lot better if you follow these eleven oral hygiene tips. However, you may still run into some issues since good oral hygiene won’t prevent every single problem you could experience. If you’re having any issues with your teeth or your gums, contact us at Central Florida Periodontics & Implantology today to learn more oral hygiene tips to care for your mouth.